Harry Sydney III is known for his Straight Talk-Sound Direction. Whether you prefer a conversation with a friend on a golf course, a talk from a coach in the locker room, or a slap on the backside from a teammate, the story of Sydney’s path from North Carolina to three Super Bowls and on to the founding of My Brother’s Keeper, will inspire and challenge you to overcome the odds standing between you and your destiny. When a stranger was willing to give Harry some straight talk, he realized the importance of sound direction and the work he needed to do came into focus. 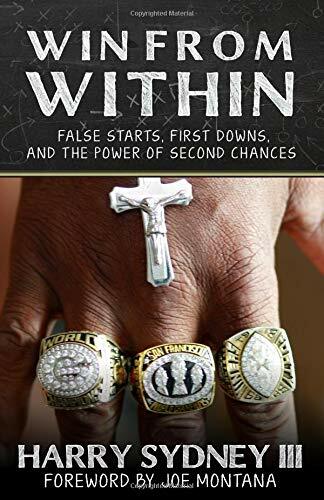 Told in Harry’s unique voice, Win From Within takes readers on a journey across the U.S. and Canada, from an abusive and alcoholic home to locker rooms filled with world champions; chasing his dream, developing his story, defying all odds and overcoming disappointments. Packed with insight, wisdom, and practical application, readers will witness the dedication and determination it takes to dig deep, walk with integrity, never quit and Win From Within. Friend and former teammate Joe Montana adds his words to Harry’s story by penning the foreword to this book. Joe, along with Jerry Rice, Brett Favre, Mike Holmgren, Robert E. Harlan, and many other NFL players, coaches, and front-office officials have supported the work that Harry has done and continues to do for his local communities. Visit our Book Sales page on the website HERE or stop by our office at 1463 Main Street, Green Bay, WI 54302 to purchase your copy today! !